Here is the seventh of my top 10 Thailand golf courses. 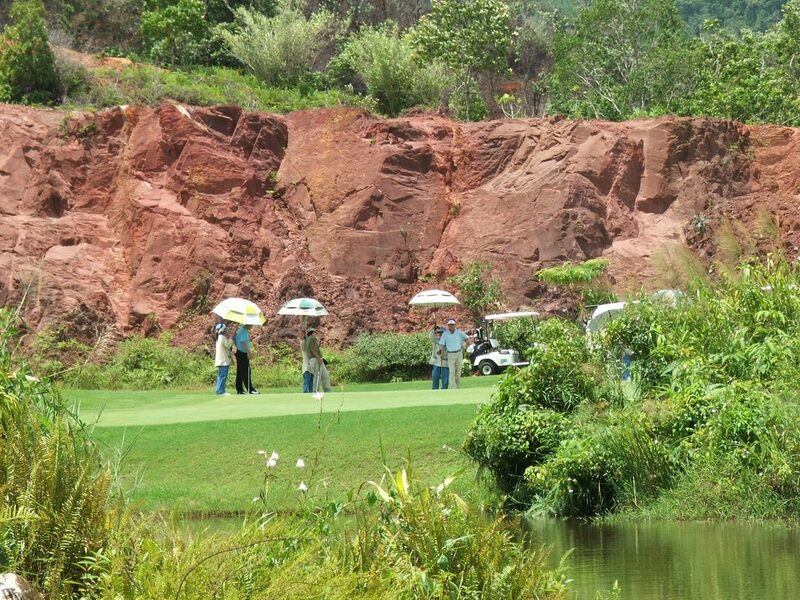 Red Mountain, near Phuket’s main tourist location of Patong, is one of the most dramatic courses in Thailand. Opened in 2008, the 6900-yard sister property to nearby Loch Palm Golf Club winds its way through a stunning former tin mine in the heart of Phuket's central highlands. It’s not difficult to see why this golf course was named Red Mountain. It is harder, however, to imagine how such a dramatically undulating landscape, where soft red rock and dense jungle were the principal ingredients, could be transformed into a challenging, yet playable layout. The course cleverly takes advantage of a huge variety of landforms and dizzying elevation changes. Scars left from the tin mine era have been imaginatively incorporated into the overall scheme, creating a unique character, while establishing an indelible link with an important era in the Island's past. Among its many memorable holes is the 169-yard par-3 17th that plays from a tee elevated some 40 meters above the green. Although index 18 on the scorecard, it requires a precision shot to hit the putting surface. The subsequent downhill par-5 requires strategic placement from tee-to-green, and can easily add double-figures to an otherwise respectable scorecard. To avoid your immensely scenic Red Mountain round turning into a rocky horror show, the advice is simple – carefully consult your caddie on club selection, take dead aim, forget the surrounding jungle, and trust your swing. Red Mountain is a proud member of Golf In A Kingdom; the collection of Thailand’s best golf courses and resorts.